This peak is #68 in Prominence List for British Columbia .A glaciated peak located 11 km west of the Fraser Headwaters, 4 km outside Mount Robson Provincial Park. It is east of Canoe reach and north of Ptarmigan Creek. 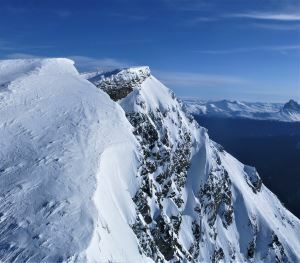 The peak is steep and rugged on the eastern face, and has a steep glacier on the western slopes. It would be difficult to climb from any direction. There are no convenient lakes or meadows for a camp. Name Notes: Named after the arctic exploration ship USS Jeannette which became trapped in the ice in 1881. The ship was originally built as a Royal Navy gunboat Pandora, and used to investigate the disappearance of the Franklin expedition. It was then purchased by Bennett for the ill fated Jeannette expedition, which was to search for the Open Polar Sea via Bering Strait. The ship was under the command of Lieutenant Commander De Long. Most of the officers and crew died in an attempt to reach the northern shores of Siberia. the last entry in De Longs journal was Sunday Oct 30, and over the previous 10 days most of the crew had died one by one of starvation. These journals were available to the members of the Karluk, along with a drift chart. This caused Mackay, Murray, and Beuchat of the Karluk to strike out on their own and perish in the heaving ice.